Hmm. Hopefully participation will pick up, now that summer is over. On the other hand, the next few weeks will be an erratic schedule. First play for Gili. Gili was slow to differentiate the characters, but she discovered who Mr Jack was by turn 7 (purple). However, she couldn’t manage to jump on him by the end of turn 8. We switched sides. I eliminated four characters by the end of turn 1, and two more by the end of turn 2, but that’s how it stayed until the end of the game. Turn 8 I guessed wrong. First play for Gili. This is still a great game. It’s one problem is that too much can swing on a lucky pick (raid R&D and topdeck 3 points, when you only need 7 points to win the game). After the game, I cataloged all of my cards and added them to my Netrunner entry on BGG. They’re for trade or for sale, if anyone wants. I just don’t think I’ll get to play it much, here. Welcome back to a few irregular regulars. First play for both of us, I taught this new game to Gili who liked Odin’s Ravens. Jambo is in the same niche of two-player light games. Jambo is a card game for two. Each player starts with a six space market and several cards. The market contains six types of goods. The main cards have 3 goods on them and two numbers: the smaller number is how much the goods cost if you buy all three at once, and the larger one is how much you earn if you sell all three at once. So the essential mechanic of the game is getting the cards to match up correctly. A whole lot of other cards do special actions, like add more space to your market, start an auction for some cards or goods, take something, swap something, cause your opponent to discard something, and the like. Each round you get five actions, of which you can only add to your hand one card. We found this to be a very harsh limit, and it provided a slowdown for us in midgame after we both had basically nothing left in our hands. Hand management is therefore very important. It was a nice game, about as nice as Odin’s Ravens was the first time I played that. I still like OR, but I don’t usually suggest it. We’ll see what happens with Jambo. They played this as a starter game. First play for all of us. This is a nice game, reminiscent of other games, but not quite like any other. You build cities by adding various buildings to your cities using money or actions or both. You need to add quarries to increase you money supply (or take an action to get money). You need to add farms to increase your food supply to feed the people on your buildings. You need to add markets and fountains to allow your city to grow beyond a certain point. And you need to add buildings in three different colors for two reasons: 1) at the end of each year, people move from cities with less of one of these colors to cities with more of one of these colors, and 2) a city scores at the end of the game if it has at least one building of each color. In the first place, your actions are limited, so you have to make trade-offs. This is nicely done. And in the second place, having extra people is more buildings and more power, but if you exceed your food production, you are hit hard. That makes acquiring extra people dangerous. In fact, forcing other players to take your people is often a tactical powerhouse of a move. Quite the opposite of common sense, but nicely in keeping with the theme. The board and bits are pretty, if a bit much and over-produced for what was really necessary. It’s a nice game, and I look forward to playing it several more times soon. In our game, I realized a bit ahead of Avraham how more people is not necessarily better. Especially on the last round, where too many people equals a lot of negative points, I made sure to keep some extra food around. In fact, Avraham tossed me an extra guy and I had exactly enough. I also had the most cities. Gili was drained too much by Avraham’s nearby cities and so had the opposite problem: not enough people and room. First play for Binyamin and Adam, and look how well Binyamin did. I heard a lot of voices saying that while Agricola is a nice game it is simply too long. Well, with new players it is definitely longer. My last games haven’t been too long, but it takes four or five playings before you get to that point. Again, a plowed field strategy beat a stone house strategy. I taught this to Avraham. I was thinking of selling this (or sending it to my secret santa recipient) since no one around here wanted to play it (i.e. David doesn’t want to play it). And it’s true that there’s a different type of luck factor in the game, but Magic also has a tremendous luck factor in it; most of our Magic games end by mana screw, after all. Once a Netrunner game gets going, it’s always a great game, regardless of what cards come out. The only thing to watch for is if the runner has no icebreakers of the type he needs. Then he’s in trouble. In our game, I messed up the rule for activating Nodes, but even so it was an excellent bit of fun. Well, for me, as I won. But Avraham liked the game, too, and will play it with me again if the opportunity arises. Game night was interrupted for a half hour by a visit from Kindershpiel’s representative, delivering a few boxes of different versions of Apples to Apples to me, to assist me in my work in creating Hebrew versions of the game. Jack came about half a year ago, so this was his second visit. He knows some games already, so was prepared to enter into anything we could throw at him. These three began with a light game, while the rest of us started something a little heavier. I suggested Princes of Florence, but somehow this ended up on the table, yet again. The only problem I have with it is that a) Nadine and David tend to take a long time to think through their moves (and end up playing better because of it), and b) too much cooperation going on, with everyone figuring out the best moves for everyone else. As a result of a), Binyamin and I played a side game of Netrunner while this game was going on, whenever it dragged down. Amazingly enough, aside from a few points at the beginning of the game, it didn’t drag down too much, even though it certainly took a long time to play (around 3 hours, not including a small break we took in the middle). Note that we also played with a special rule change: A third row of power plants was added atop of the other two. This row merely revealed the next 4 plants coming up in the deck (no reordering or taking the highest or lowest from this row, surely a stack). As a result, the main other complaint we had about the game, which was the luck of a good power plant coming out, or a bad one coming out, after you made the best play, was entirely eliminated from the game. In my opinion, the change was an excellent one, and I intend to play with it from now on. In our game, we played on the U.S. map with the Southwest blocked off. I had never tried starting on the expensive Northwest but decided to give it a go. It is, without question, the reason that I lost. I was expecting fighting in the East coast to offset the slightly higher prices I was paying on the West, but there wasn’t any real fighting on the East. As a result, I was simply paying more and getting less each round, and that was all there was to it. In the end, I had a line of plants stretching from coast to coast, but this was not a pick up and deliver game. David and Binyamin took the East coast, with Jack and Nadine in the center. Jack ended up going all green, while I had some early nukes. Coal and oil were therefore incredibly low priced for the entire game, as was most of the fuel. Adam taught them all this game (reminded Elijah, actually), but somehow lost anyway. They finished it in reasonable time, so I guess didn’t need the round limit that I generally impose on the game. This is a game whose main luck component is hidden cards and picking from them blindly. What this means, is that the shorter the game, the more luck and therefore the less interesting. Our game, in contrast, was a long slow buildup, which made the game lots and lots of fun, very interesting and pleasurable. I still wish the game had a few more “Instant” like cards and direct targeting cards; I may need to buy a few more packs of cards. I played the Corp and Binyamin the Runner. He played no hardware the entire game. However, he had a card that let him take the top card of his discard pile and a card that let him look through his deck and choose any card, As a result, he spent two actions almost every round simply picking any card he wanted from the deck. I had a good deal of ICE out, but ultimately he found a way to my HQ through my Archives and pulled the last Agenda out of my hand. While Kindershpiel was talking to me (and Binyamin), these guys played some San Juan, abandoning it mid-game when we resumed Power Grid. While we wrapped up Power Grid, these guys played an entire game of Tichu to 1000 points. At least once, a nine card straight from Adam was beat by a higher nine card straight from Zack. Jack is an experienced Ra player, so it didn’t take him long to adjust to Nadine’s Jewish themed version of the game. He had quite a collection of monuments, so I’m surprised to see that he didn’t win in the end. It’s mainly due to his first round score of -5 to Nadine’s 9. 21 Participants, for a fairly smooth, albeit loud, Games Day. My apartment is simply too small for this. I must find a larger place for next Pesach. Sukkot we play on the roof, anyway, so the noise is not so bad. Avri is a player from Beit Shemesh who came for the first time, bringing his brother Rafi. Rafi brought his brother-in-law Shlomo, and Shlomo brought his brother Meir. Or something like that. Keren is a reader of my blog, and she came by for the first time with her friend Debbie. Except for Gili playing Settlers with them, I somehow neglected them while they were here, which I feel bad about. Come again, and I promise to play more with you personally. Itamar brought his nephew Nadav, and Binyamin brought his kids Tikva Shira and Zvi Yehuda. Pinchas came on the last few Games Days too, and he is an old Bridge partner of mine. I taught this to the kids; they kept forgetting the rule about rows not going past 24, and Z”Y never quite got the way you get points. Nadine was ahead 2 points in the interim scoring, 15 to 13 to 13. We played this simultaneous with our game of El Grande, while waiting for people to take their turns. They played one hand of this at the end of the evening, waiting for the Amun-Re game to end, so that Binyamin could take the game home. Binyamin taught us this version of Carcassonne. It has the usual three area types, but one third of the way through the game you begin placing walls and towers around the tiles. The most significant difference is that only roads have to match, not areas. We found this to be a huge huge Bad Thing. Most of the tactics of Carcassonne derives either from merging with other areas, or from locking opponent’s areas so that they can’t close them. This rule significantly reduces both of these options, making the game simply a matter of picking the best tiles and putting them down in the best places each turn. Whoopee. It is one of those situations where too many opportunities for scoring makes a significantly worse game, rather than a better game. There is not enough tension. I got luckiest. Nadine made a few sub-optimal choices, according to Binyamin, and he got upset enough to leave the game early. Ben filled in for him for the last few rounds, without any understanding of the rules. Pinchas loves Chess, and I play very infrequently, and totally tactically. I also get bored with games where it’s clear that one person is winning, and the only way for them to lose is to make a dumb mistake. So I enjoyed the game at the beginning where I managed to secure a lead over Pinchas by a Knight and a Pawn. Then I got bored, moved too quickly (I should mention, perhaps, that I don’t like to take too long with my moves, and I was also simultaneously playing El Grande at the time), and went down to a single Pawn advantage. In the end, I didn’t feel like dragging the game out for another 50 moves, so I lost a few more pieces and resigned. It was a little rude of me. Sorry, Pinchas. Keren and Debbie played a game of this later in the day. This is one of our grails of gaming – simply getting it onto the table. That took most of the day. The rule explanation then took another hour and some, as usual, and it was about three hours before we finished the first round. I was really hopeful we would finish the game, for once, because we were ll enjoying it, and the second round went much quicker and smoother. But Gili had to leave before the game would finish, so we only finished three rounds. We all really enjoyed it, for what we played. There are a lot of rules that I have to keep digging up and remembering, but we all suffered the adverse effects of this, and managed to keep on forging forward, anyway. I made the mistake of having a slight early lead after round three, which made me a target. And this despite the fact that this is Nadine’s signature game. And she won, of course, in the end. Nobody was horribly behind the whole game. I taught them this game as a brain cleanser between the games of Power Grid and Santiago. Rafi won it. They played two games of this, while we were davening Mincha. I think I didn’t explain the rules completely. I believe they were drawing and then playing, and opposed to the other way around. These guys were looking for what to play and started with this. 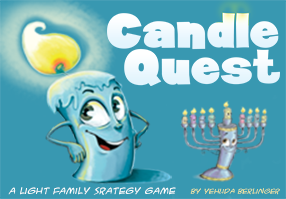 Binyamin warned them that it wasn’t really their type of game, and he turned out to be correct, and they abandoned the game halfway through, not particularly enraptured. They also complained about the sameness of the colors on the chips and other design elements. Rather than try to find my Magic lands, I taught this to Binyamin. I first played the Corp, while Binyamin drew a number of expensive cards and couldn’t quite get together a cohesive attack. I took home 5 agenda points without too much trouble, and we decided to switch sides. We then played the fastest game of Netrunner ever played. Binyamin played his turn and didn’t protect R&D. I raided R&D three times and pulled three agendas, totaling 8 agenda points. Game over. Perhaps there is a tad more card luck in Netrunner than in Magic, after all. Saarya taught them this, and naturally won, as the only experienced player. The others bought too many power plants. They played on the US without the NW, but no one even made it into the SW. I should note that Shlomo’s dismal score is not due to lack of plants, but probably being shut out of fuel. Tal would like it noted that she was leading at one point. Keren and Debbie also looked interested in trying this game. As you can see, a close game, with Avri scoring well for his first time. I suggested this one to them, and they were all first time players. They seemed to enjoy it. I was going to play this with them, but Gili sat down before I got there. They all enjoyed it, even though Gili was the more experienced player and gave them a trouncing, it appears. Pinchas likes Chess, so Adam taught his this Japanese game of Chess. Unfortunately, all the pieces were disks with Chinese writing on them; I have no idea how Pinchas could ever distinguish the pieces. The award for the day’s longest game goes to this, not Die Macher. They started playing at 12:30, and ended, without finishing the game, at around 9:00 or so. I have no idea what they accomplished during that time. The biggest problem was that none of them were native English speakers and the cards were all in English, so they had to keep running to Binyamin for explanations. Played at the end of the evening. A light game group tonight. When I first got home, I found Nadine waiting, and together we did a lot of cutting and drawing to try out my new prototype. Eventually five of us gave it a go. However, the components were so crude, and the crowd so not into trying a new prototype, that we didn’t even get through the rules before they made me start some example rounds. And we only got through one round before they wanted to try a real game. Which doesn’t mean that they didn’t see potential, only that it wasn’t the right time for it. Nadine and David both said that it looked like it might be interesting. I will have to make some nicer components and try again. Once again they were plum out of both oil and coal for most of the game. Zack eventually had a garbage plant and was happy. David was surprised when he won. We tried this area control game again. It still appears to be a flawed game with a nice core and good theme. The game began to drag on, and we called it quits after 12 rounds. I began the game by saying that we have to impose a turn limit, which is what I learned last time we played. I think 10 turns is probably about right. Adam, on the other hand, favors devaluing the points from the masses tokens. All three love the game. Zack and Adam each had a turn being the Master, and both guessed the other’s rule. David began to have a bad night at this point. He built his runner deck out of my pathetic 60 cards, and each time he couldn’t draw a sentry ice-breaker to save his life. He gave up three games in a row, once after his first turn. I’m afraid that this left him with a bad taste about the game. If the game is so dependent on drawing the right ice breakers, it’s not fun to play when you don’t. I wonder if this is solved simply by tuning the deck with more cards, or if we just have to stack one or two ice breakers on top to make the game enjoyable. I didn’t see the results of this game. From one ignominious defeat to another. David had only played this a time or two before, and so didn’t think through the implications of some of his card play. After falling to two piece behind, he gave up in disgust, to fight another day. This entry was posted on March 7, 2007, in Session Reports and tagged by hook or by crook, children of fire board game, lord of the rings the confrontation, netrunner, power grid, zendo. I had had enough of work by mid-day, so I invited David to join me a bit early. In this way, we were able to get in a few games before game night actually started. David and I are beginning to grasp the game, and only twice needed to look in the rulebook. I was able to grasp the possibilities of a few cards that David had overlooked when he was Runner last. Only this game did I grok that accessing traps can hurt you, even if they are accessed from HQ or R&D. That was a fun lesson. I made many fast and furious runs on HQ and R&D until David put enough Ice in place, and even then I kept doing it whenever he didn’t have enough bits to rez the Ice. My runs on HQ were spectacularly unsuccessful, but my runs on R&D eventually gave me the win, although it was close. Both of us lamented that what seemed to be missing from the game were “Instants” like there are in Magic. If I’m making a run, there is nothing the Corp can do about it by playing special cards from his hand. This eliminates a bit of the tension in the game. I introduced this to David, who spent a long time calculating each move. I took an early lead with a forced swap that gave me two jumps to his one; I probably won’t get away with that again in a future game. After that, we did some swapping, but I was able to get the better colors, until I needed only a single gray or white ball to win, while he still needed at least two more balls to win. He conceded. I still like the game a lot. While waiting for David to make his moves in Zertz, I played a few games of this as a filler. We played two racks, both of which had a paucity of words. I came up with about 7 words in the first game, two of which Nadine didn’t have. The second rack was about tied, with Nadine having maybe one more word. I think this is my first win for Louis, and it was not only a win but a massacre. This was Adam’s second game, and he needed a refreshing of the rules. It started out innocently enough, with me slightly behind after the first round, even. I had only managed one mission, while Adam and Elijah both had two. However, I had gained a slew of peripheral items from the previous round, including coats-of-arms, ax extra influence card, money, and an influence marker on the board. This allowed me to dominate the second round. At the end of it, Adam couldn’t complete a single mission, Elijah could complete only one, and I completed two. I ended the second round the same as the first, with tons of peripherals, and this time I was last in the bidding order. I ended up with three additional moves after all the other players had placed. Adam and Elijah both went to four missions, while I was at seven. The game was already over at that point. In the end, I ended with a hand full of coats-of-arms, too, to add insult to injury. They played on the East and Central coast, which are the cheapest areas. A glance in mid-game revealed that their fuel market was nearly exhausted, or completely exhausted, the entire game. As usual, a close game, with the win decided on a tie (not my favorite mechanism, actually). The game took around three and a half hours, as people added and added again near the end of the game (also not my favorite mechanism). Nadine taught Idit how to play, and this was Josh’s fourth game. Apparently, they all enjoyed it. Idit didn’t have any large buildings at the end of the game, and her settlements were nearly all corn and sugar, a result of some Hacienda activity. Adam didn’t have the Icehouse pieces, so we played “Sentence Zendo”. Adam wrote a sentence that was, and a sentence that wasn’t. We went through about a dozen sentences, and I had no idea. Elijah and I started guessing “sentences” that were not grammatically correct, and even simply words, which seemed to annoy Adam, who said that we really should only be allowed to guess real sentences. I was thinking two structurally – number of words or letters, and so on – when it turns out that the rule was that the sentence have “something to do with nature”. We were casting about for some fillers. I suggested this and both of them agreed well enough. Both of them prefer the basic game. Nadine was a little bored at the end of it, however, I think. But it’s quick. I still like it a lot. We only made it partially through the game and then broke for Bridge. I had nothing better to open with, so I decided to give Crane another try, despite being nearly 100% positive that it is a wretched, wretched card. Why? It turns all of your 2 and 3 VP cards into 1 or 2 VP cards, and it also destroys all the VPs you get from having more buildings at the end of the game. In my game, I turned my Indigo into Coffee, and then debated on whether to turn it into Silver or Library on round three. I chose Library. This netted me an additional card from Prospector every round, but in the meantime, Nadine and Adam were gaining 4 cards each every two rounds from Production and Trading, while I had no production buildings at all. When I finally got out a Tobacco building, we abandoned the game. Eh; I might still have won. We played five hands of this. It is so sublime a game, that we don’t really keep score. We simply zen the experience. I had fairly few points, but David had good hands. He ended up playing three of the five hands (making one of them, I believe). Adam taught Zack how to play this on a 9×9 board, and then they played three games. Adam spotted him first four, then five, then six stones, which gives you an idea of how they turned out. Elijah’s favorite game, was a game that Josh wanted Idit to learn, anyway. I have no further info on how it turned out, or what powers they played. I know that they played with Lucre and (against my advice, as usual) comets. I heard some good news and some bad news from Josh and Idit. The good news is that they’re engaged (Mazal Tov). The bad news is that they are returning to the U.S. indefinitely in May and getting married there. Oh well. Rachel and I were a little late with dinner again, so Eyal sat around a bit while we ate. After that we taught him how to play Puerto Rico without actually playing. We also almost played Geschenkt. A game of outright lying and deal-breaking. Shevi had an opportunity to win at the end of the game but didn’t take it because she considered the basic mechanics of the game to be cheating. Every time people come to the game group they clamor for the games that they want to play. Zack always wants to play Wild Life, Elijah always wants to play Cosmic Encounter, Adam always wants to play Modern Art, and so on. When people don’t agree on games, they then start hashing out what they are willing to play, but constantly change their commitments as they hear of new possibilities. It only proves that we should never play any outright negotiation games. In this instance, we managed to cure Zack of his Wild Life obsession. Even with only four people, the game took three and a half hours. And it wasn’t on my turns that the time went on (I took an extra minute for my last move, but that was all). Frankly, after all the thinking by some people, and lack of thinking by me, the game progressed rather evenly. Nadine believes that the card draw is too luck dependent. I suggested that next time we divide the cards evenly among all players, letting them pick ala Torres. Zack was finally tired of the game and just wanted it to end. But he said it was better with more players (5 or 6) since there was more competition that way. On luck in Wildlife – the same as with many games of this type – with skilled players who know the game and optimize, luck, such as with cards, is more of a differentiator than play ability. And there don’t seem to be different strategies, it’s tactical, where most people would do the same thing in the same situation, unlike Puerto Rico where there’s more worthwhile variability. While I played Wild Life, I taught Binyamin how to play, and, like others in the game group, abstracts are not his thing. I gained a white ball advantage, and forced a few more exchanges, gaining whites each time for the win. Then Gili taught Binyamin this game. I don’t think they finished it, but Gili was in the lead. I didn’t see this one. I didn’t see this one, either. Binyamin apparently had 9 in all colors. Another I didn’t see. Apparently, Binyamin and Elijah compromised their way with each other several times to a double win. This time the game went more smoothly. We both removed cards from our basic decks to bring us down to minimum sized decks. We only had to look up one rule about Nodes. David ran my R&D once, and then pulled agendas from my HQ three times to win. I managed to get two agendas fulfilled, so it was a close game. David became a little disenchanted with the game after realizing that winning is partly due to luck, since running is so often blind – on hidden cards, and pulling cards at random out of HQ. While of course there is a little luck in this, I still think that it is on par with, or even less of a problem than, the luck in Magic. So I am still quite enamored with the game. David is now asking to move onto the next CCG, Middle Earth. This was Eyal’s first game, so Nadine gave her usual tips and helps along the way. Eyal’s novice moves threw Rachel off of her game. Between the two of these events, Eyal managed a newbie win. I didn’t give my usual tips and help along the way to Eyal. I had time to explain the game beforehand, and he understands games. I told him to ask if he had questions. Both Rachel and I restrained ourselves, even when he let me trade sugar early instead of forcing me to ship. But when I was going to have the opportunity to trade coffee, we explained to him what was going on, but at that point he didn’t stop me because it would have caused him to lose goods. Most of the time he figured out the best role for himself. He did Craft somewhat frequently, but with 3 player it benefits both players more than in 4 or 5 player.